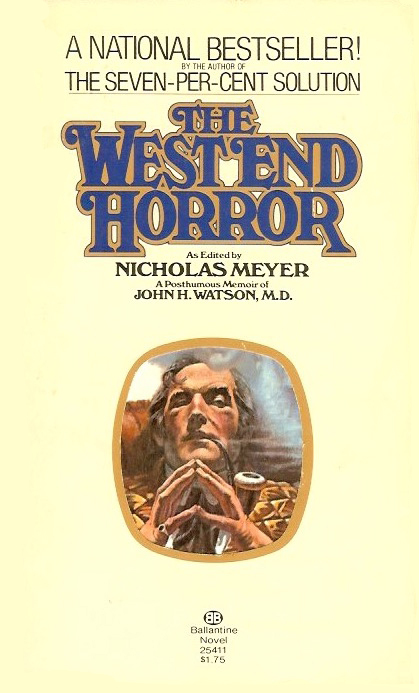 First released in hardcover in 1976, this is the mass market paperback edition of Nicholas Meyer's second Holmes novel, The West End Horror. The cover has a cut out window that opens up to a full illustration showing the book's major players (below). THE GAME'S AFOOT AND HOLMES IS GIVING CHASE! March 1895. Menace stalks the renowned West End. A maniac more terrifying than Jack the Ripper is on a rampage through London's glamorous theater district. What baffles Scotland Yard is elementary to the great detective–until Holmes finds himself in the clutches of the grisly murderer! With the ever faithful Dr. Watson by his side, Baker Street's legendary sleuth sets out to snare the elusive killer with the help or hinderance of struggling writer George Bernard Shaw, Gilbert and Sullivan, a controversial wit named Oscar Wilde and London's novelist woman, actress Ellen Terry.